Theology isn’t a dried-up system of intellectual affirmations divorced from passion for God; rather, it’s a life-transforming, gospel-centered summary of God’s truth we’re to gladly embrace. Sound doctrine is critically important because how we think about God and God’s Son is critically important. It changes how we live, how we act, what we say, and what we do. Therefore, we need to learn to think deeply and accurately about God. Concerns over false teaching and lack of sound doctrine aren’t only an issue for the American church. Many African pastors are in desperate need of resources that can train them in biblical doctrine. As you read below about the need in East Africa, and how you can help, I encourage you to consider giving generously to this project, which I believe will have a ripple effect for decades to come. As pastors gain training in solid doctrine, and preach and plant Bible-believing churches, individual lives and entire families will be changed. What a privilege to further God’s kingdom in East Africa! TGC has a unique opportunity to contribute towards the needs of the African church by providing theologically rich and accessible books to aid in the equipping of church leaders. God has allowed us to build trusted relationships with many key ministries and distribution partners who are enthusiastic about our mission of Theological Famine Relief. The nations of East and Central Africa are afflicted, like much of the continent, by a dearth of biblically faithful, easily accessible, gospel-centered resources. Pastors labor in our hinterlands working with nothing but a tattered Bible and no theological training. 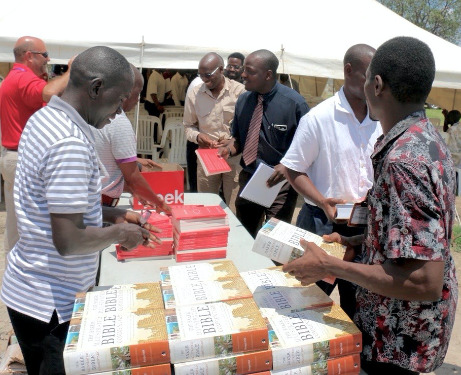 They lack the Ksh 500 ($5) that it would take to invest in a new Bible—let alone quality theological materials. Our goal is to publish upwards of 100,000 copies of a dozen strategic English-language titles, in collaboration with indigenous African church leaders and expat workers. Books are being chosen based on the needs of the indigenous church, and will be donated and distributed through our Theological Famine Relief mission and network. Giving Goal: We invite you to contribute towards raising $75,000 online, with the first $25,000 being matched by generous givers, to reach a total of $100,000 for this project. Pray: Please ask the Lord to provide an open door for ministry through strengthening church leaders in Africa with solid, biblical resources which are published right there on the continent. Network: We already have good English books available from our stock in America. Spread the word to your key contacts in Africa to ask short-term and long-term workers to bring resources on their next trip from the United States. Give: Consider a generous gift to this cause to see church leaders gain access to trusted teaching from the Scriptures in order to impact their own preaching and leading of congregations in Africa. Our ministry has the privilege of contributing $20,000 in matching funds to the project. If you’d like to help support it, you can donate directly on their website. I’m honored that several thousand copies of my book Touchpoints: Heaven will be printed in Africa as part of this project, and distributed so that pastors can study and learn what God’s word has to say about our eternal home! I want to post this remarkable article you may appreciate. (Or maybe not.) Following the article, I'll share some of the ministries in Africa supported by the royalties from my books.